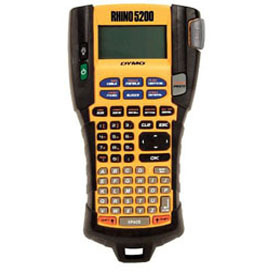 Dymo RhinoPRO 5200 Label Maker - The portable, affordable RhinoTM Industrial 5200 saves you time and money on every job. Press one "Hot-Key" to format text into perfect patch panel labels; press another to print matching cable flags or face plate tags, without retyping. It's just as easy to print wire wraps, terminal/110 block labels, barcodes and more. Includes: RhinoPRO 5200 labeler, CD with users manual & ¾" White flexible nylon tape.